The final Arizona Free Fishing day is Saturday, which means no fishing licenses are required for fishing in the state's public waters. Bring the family, wet a hook and take advantage. Now's also a great time to fish the Rim Lakes. Anglers are saying Power Baits, worms and salmon eggs have been successful, as well as ultra-light rod action with Panther Martins, Super Dupers and Mepps. James Goughnour of Rim Country Custom Rods said fly anglers are having success with Crick Hoppers, a cricket imitation bait in the early morning and late evening. This week, lots of trout are being stocked in Bunch Reservoir, East Fork of the Black River, the Little Colorado in Greer, Long Tom Tank, River Reservoir, Scott Reservoir, Sheeps Crossing, Show Low Creek, Silver Creek, West Fork of the Black River (50 Apache trout) and Willow Springs Lake. Also, Tonto Creek Hatchery has just stocked Tonto Creek, Haigler Creek, Christopher Creek, East Verde River and Bear Flats. For the rest of June, the hatchery will stock the creeks and Woods Canyon Lake. Locate any of the above fisheries on our interactive Fish&Boat map. Bass are in post-spawn mode and generally scattered across lakes. Look for the night bite on bass to improve in the coming weeks as triple-digit high temperatures remain consistent. Already, water temperatures at some desert lakes have tipped the scales at 80 degrees (Lake Pleasant reached a surface high of 80 degrees on Thursday). The most consistent bite has been off dropshots. But bass are hit and miss and at some desert lakes have been reluctant to chew. If these techniques are working fo you, or if you're having luck with different presentations, email your photos and fishing reports to BFishing@AZGFD.gov. Striper fishing under the lights should be a prime option in desert lakes such as Lake Pleasant this weekend. Saturday is the new moon, so look for shad to be congregated around your lights as soon as you drop them. For more details, find Lake Pleasant in the full fishing report. Moving onward to the long-whiskered line-ripper. The catfishing's only going to improve at the desert lakes. Stake out the best chunk of shoreline, throw out a lawn chair (or pull up a log), secure a stout pole and cast some of the stinkiest bait you have for channel catfish. Anglers are allowed two hooks per line. Hot dogs, worms, chicken livers all are proven baits and generally are latched onto a treble hook or size 1 or 1/0 baitholder hook. Bluegill also are a viable target. 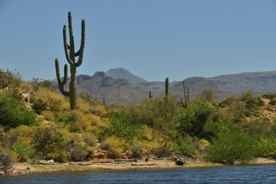 Try fishing just after the sun comes up and target the backs of coves and some of the humps in desert lakes such as Lake Pleasant. Pieces of nightcrawlers on small hooks (No. 10 or smaller) and 6-8 pound test line can get plenty of these tasty sunfish. Crappie, meanwhile, are hitting out at Alamo by the dam from 10 p.m. until dawn -- this according to multiple reports. Finally, the top-water bite is turning on in the morning at many desert lakes. And don't forget that there are unlimited bag and possession limits until next April at C.C. Cragin (Blue Ridge Reservoir). But you'll need your ticket. If you don't already have one, licenses can be purchased at any of the 320 license dealers, Game and Fish offices, or online at www.azgfd.gov/eservices/licenses.shtml.